Top price among PTIC heifers went to this line of 19-20 month old Simmental x Angus heifers averaging 480kg, making $1530. In calf to Angus bulls, the heifers from Orange, NSW are heading to Nimmitabel, NSW. 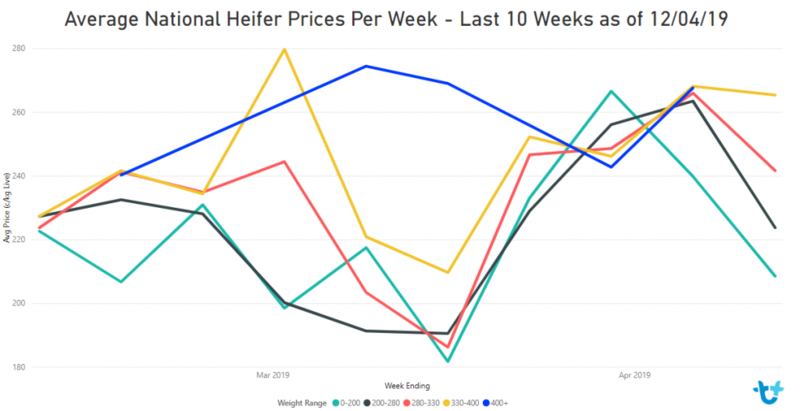 PRICES were down on most stock categories apart from PTIC heifers on AuctionsPlus this week. After last week’s dramatic jump in listings volume, cattle numbers remained steady with a total offering of 16,259 head. The Weaner & Yearling sale attracted the bulk of listings with 11,845 head listed. New South Wales again offered 65percent of the catalogue, with Queensland contributing 25pc. PTIC heifers sold from $920 to $1530 to average $1245. Top price went to a line of 19-20 month old Simmental x Angus heifers averaging 480kg, PTIC to Angus bulls, from Orange, NSW. These heifers are heading to Nimmitabel, NSW. A line of Landfall blood Angus heifers 18-20 months averaging 473kg, PTIC to Angus bulls, from Ross, TAS sold for $1420 to a local Tassie buyer. PTIC cows sold from $700 to $1450 to average $1025 this week. Proven breeders averaged $1110 and mixed aged lines averaged $913. Top price went to a line of Hazeldean blood Angus cows from Cooma, NSW. These cows were rising 5 years averaging 556kg and were PTIC to Angus bulls. Another highlight included a line of Te Mania blood Angus cows from Gunning, NSW which sold for $1110. These cows were aged 3-10 years of age averaging 525kg and were PTIC to Angus bulls. Cow and calf units sold from $510 to $1770 this week, to average $1168. Top price went to a line of Banquet blood Angus cows and calves from Casterton, VIC. These cows were 3-4 years averaging 466kg. From Cooyar, QLD a line of crossbred cows 4-11 years averaging 428kg sold for $950. The Santa and Hereford calves at foot were 1-7 months old and averaged 157kg. Weaner steers sold from 223c to 342c this week to average 297c, down 10c. Top price went to a line of unweaned Hereford and Hereford cross steers from Bridport, TAS. These steers were aged 8-9 months averaging 272kg and will remain in Tasmania. Weaner heifers sold from 99c to 275c to average 233c, down 29c. Top price went to a line of Angus heifers 6-8 months averaging 204kg. Yearling and grown steers sold from 216c to 332c this week to average 285c, down 12c. Top price went to a line of Angus steers from Walcha, NSW, 17-20 months averaging 438kg. Yearling and grown heifers sold from 97c to 300c to average 228c, down 30c. Top price went to a line of Drayton Park blood Red Angus heifers 13-14 months averaging 387kg.